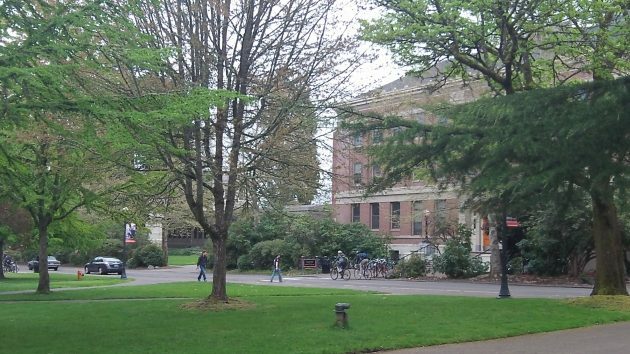 OSU is one of the schools wanting to shield undocumented students from deportation. Oregon and Oregon State say they won’t cooperate with any federal attempts to track down and deport undocumented students. The presidents of the universities last week were responding to student concerns about what the Trump administration might do. The presidents and the students might worry less if they reread what Donald Trump, on the subject of illegal immigration, has actually said. What he said, on his campaign website and in a long speech in Phoenix, Ariz., on Aug. 31, is open to different interpretations if you look at individual pieces or phrases. But the overall thrust is that Trump wants to proceed first and mainly against “criminal aliens.” He’s talking about people who have been convicted of crimes and who have somehow been released or otherwise allowed to stay in this country. Trump says he intends to cancel President Obama’s 2012 order on “Deferred Action for Childhood Arrivals,” which created at least a temporary legal status for children brought to this country as toddlers. There was no authority in law for such an order, so Trump is right to want to rescind it. But that doesn’t mean he wants to deport people for whom America is the only country they have ever known. Trump says he wants first to secure the southern border and get rid of criminals who are in the country illegally. When that is accomplished, he says, all immigration laws will be enforced, but in the enforcement there will be priorities. Enforcing the law makes sense. Why else have a law? But nothing he has said suggests that it will be a priority to move against, for example, young people on college campuses. The universities want to shield undocumented students. From what, exactly? Do they think border patrol agents will invade their offices and demand the names of the handful of undocumented students granted residency status by the 2013 Oregon legislature so they can attend for in-state instead of nonresident tuition? As unlikely as that is, the schools would be right to refuse. You don’t rat out people who haven’t done anything wrong. Any university (or other “business”) that doesn’t want to follow Federal rules shouldn’t accept Federal money. Sounds like an article strongly worded to support trump and not stay neutral. “Sounds like an answer worded to not support Trump and not stay neutral. There’s a very good reason why universities don’t want to cooperate with the feds on this issue, and it’s financial. They get a lot of federal aid (and also private funds) from foreign students and they don’t want to diminish it in any way. I’m sure the administrators would like us to believe they only have high, idealistic motives, but it’s just not true. If the feds really want to get cooperation, all they have to do is threaten to withhold the federal gravy that these institutions so long for. I think the schools just want to get out in front of Trump’s rhetoric. Nobody really knows what Trump has planned. I think he will have a tough time passing any sort of reform through Congress. The fact is the people that benefit most financially from immigrant (both legal and illegal) are Republican. Go talk to farmers, see how easy it is to get a field crew once berry season starts and before the end of the orchard crop season. On a side note the farmers have the most to lose from Trump starting at trade war, which I think is also empty rhetoric. I have a feeling either Trump fails to deliver or rural America ends up with a lot of buyers remorse. Here’s the challenge: I don’t know what this vindictive narcissist plans to do. I doubt you do either HH. Or anyone for that matter. Trump is already learning the limits of power. Oh my gosh people!!! You think Trump is so evil! He is not going to send everyone back!! Liberals get your facts right! There was sooooooooo much more after this one speech!